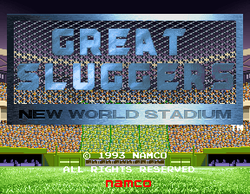 Great Sluggers (full title: Great Sluggers: New World Stadium グレートスラッガーズ: ニューワールドスタジアム, lit. Gurēto Suraggāzu: Nyū Wārudo Sutajiamu), is a baseball arcade game that's released by Namco in 1993 only in Japan; it's the first game to run on the company's then-new NB-1 hardware (a Motorola 68000 running up at 12.5 MHz with a C352 custom sound chip running up at 16.384 MHz for sound). The gameplay is largely similar to that NS2 (1991-93) era of Namco's own World Stadium series, in which both players must take controls for two of twelve real-life Japanese baseball teams in the Central and Pacific Leagues, then select one of four stadiums for the match to take place in - and two are carried over, from all the WS titles (but the Kōshien has been renamed, to the "Urban"), while the other two were created specifically in this game. All of them also feature advertisements for older Namco games, including Starblade, Pac-Man, Mappy, Pac-Land, Dig Dug, Net-tō! Geki-tō! Quiz-tō! !, Final Lap, Emeraldia, Numan Athletics, and their then-existent "Wonder Eggs" theme park, in Tokyo. CL & PBL license screen. This page was last edited on 8 October 2014, at 17:30.